This interesting and unusual surname is a transposed from of Axleby, which is of English origin, and is locational from either Exelby in the North Riding of Yorkshire, or from Asselby in the East Riding of Yorkshire. Exelby is derived from the Old Danish personal name "Eskil", similar to the Old Norse "Askell, Asketill", god-cauldron, and the Old Norse "byr", farm, settlement; hence, "Eskil's farm". Asselby is derived from the Old Norse "Askell", and "byr", as before; hence, "Askell's farm". Locational surnames were developed when former inhabitants of a place moved to another area, usually to seek work, and were best identified by the name of their birthplace. 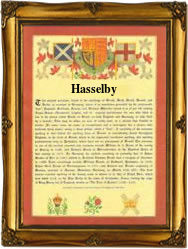 The modern surname can be found as Axleby, Axelby, Axelbee, Axelbey, Exelby, Eshelby and Hasselby. Recordings from Yorkshire Church Registers include: the christening of Samuel, son of Samuel and Frances Axelby, on July 22nd 1798, at St. Peter's Cathedral, Sheffield, and the christening of John, son of Joseph and Mary Axelby, on January 12th 1800, at the Presbyterian Church in Stannington. The first recorded spelling of the family name is shown to be that of John de Eskelby, which was dated 1327, in the "Subsidy Rolls of Yorkshire", during the reign of King Edward 11, known as "Edward of Caernafon", 1307 - 1327. Surnames became necessary when governments introduced personal taxation. In England this was known as Poll Tax. Throughout the centuries, surnames in every country have continued to "develop" often leading to astonishing variants of the original spelling.